For the 15th year in a row, Teen HYPE is presenting an original stage play written, produced, and performed by young people in our Peer Education program. Hidden In the Shadows will be staged March, 7, 8, and 15th at Marygrove College Theatre in Detroit. 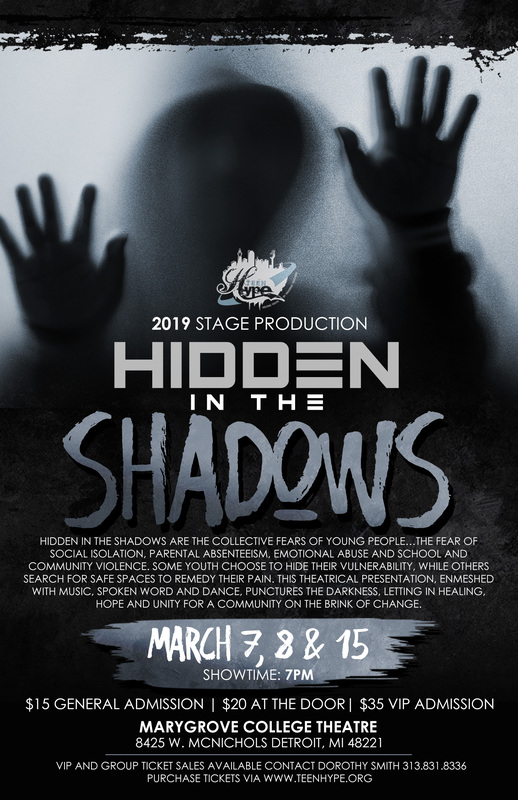 Hidden In the Shadows explores the collective fears of young people – the fear of social isolation, parental absenteeism, emotional abuse, and school and community violence. Some young people choose to hide their vulnerability, while others search for safe spaces to remedy their pain. This theatrical production, which benefits from artistic direction from noted actor Henri Franklin as well as professional dance and playwriting talent, blends music, spoken word, and dance in order to show young and old audiences alike that healing and hope are possible. Teen HYPE’s annual theatrical productions highlight pressing societal or emotional issues facing teens and provide effective behavioral strategies. The annual audience of 2,000 middle school and high school students is comprised largely of Detroit public school classes in which Teen HYPE provides health education as well as from other youth-serving organizations. Another 1,000 adults also attend the rousing production. Tickets for evening performances can be purchased online at www.teenhype.org. General admission tickets are a bargain at just $15 while VIP seating at $35 includes premium seating, backstage access and refreshments.